Blitz’s often involve coordinating movements with pinpoint accuracy – one wrong path, and the defense could leave a massive gap wide open! Football (or, as the sport is known beyond North America, “gridiron”) is perhaps the most popular professional-tier sporting activity in the United States, celebrated annually by millions of people for its fun, fast-paced action and healthy competitive spirit. Last July, this site published an article introducing a handful of American Football terms to football fans both prospective and veteran, among them the esteemed “blitz.” Perhaps one of the less ordinary (but by no means worthless) aspects of the competitive game, the ability of teams to blitz is a mechanic that not only makes for interesting football game play, but also opens the door to a discussion on game theory – that is, refined scientific strategies that, in this case, affect how a football match might unfold from a high-level perspective. Blitzes can savagely throw off an unprepared offense. When examining a blitz, both offense and defense must be diligent and make sure they have analyzed all the risks and outcomes of their actions. Blitz, officially German for “lightning,” is, in the context of American football, the procedure in which the defensive team allocates additional defenders to “rush” the quarterback. While it is known amid the sport as a defensive maneuver, the effects and implementation of a blitz can seem aggressive. Most blitz executions are recognizable by the additional defenders that are sent to rush the quarterback. The rationale play planners and strategists use in employing a blitz is that, potentially, enough defenders will be able to shut down a quarterback’s passing play and prevent any forward movement of the ball for the offensive team. However, since the defensive team in football is a constant size of 11, defenders that would fulfill a different purpose in a defensive play must be pulled away from their standard role for a blitz. Obviously, the nature of the blitz comes with tradeoffs in the forms of advantages and disadvantages. Its utility and usability is balanced by the fact that it may not always be the best choice for the defending team. Plus, many different components of gameplay influence the defending team’s strategy (what is the offensive team’s strategy? Will they anticipate and be able to counter the blitz?). 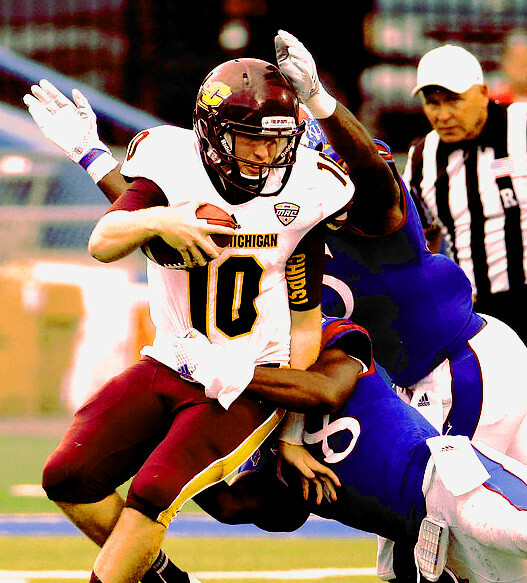 Careful strategic planning is mandatory for defending teams that consider blitzing. The risks and benefits must be weighed, and the probability of certain random happenings or actions made deliberately by the offensive team must be accounted before decisions are made for the play. Game theory often involves the use of diagrams or tables to visually describe outcomes and payoffs. This is a game table that attempts to crudely map options for the offense (RED) and the defense (BLUE). By narrowing down trade-offs to numerical values, strategies emerge. 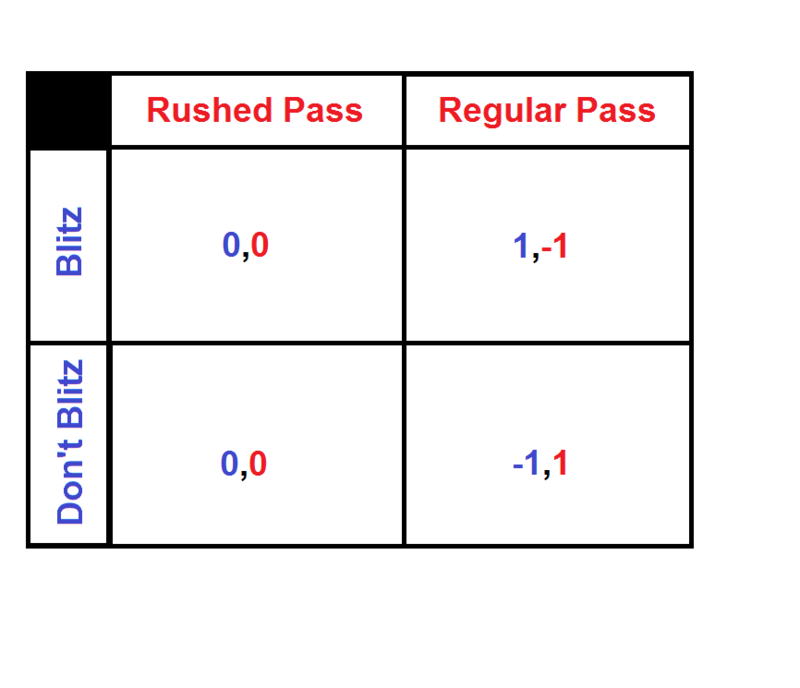 In this case, by examining payoffs from combinations of possible choices, a Blitz is most effective when the offense isn’t ready for it (and thus does not play a rushed pass). However, it may be more costly NOT to blitz if the offense takes its time and passes carefully. The choices must be weighed and decisions made! Obviously, in the real world, there is much more to consider as well. In economics and mathematical sciences, “game theory” is the study of actions, payoffs, and outcomes between opposing forces or entities in a conflict environment (commonly known as a “game.”) While in real-life, game theory applies to war, politics, economics, and various other fields, sports and simulated games can also be examined using scientific models and logical reasoning. The reason the blitz is such an exquisite part of football is because of how perfectly it can demonstrate the importance of strategy and decision-making in competitive sports. There is a lot of pressure and risk riding on every football play between formidable teams, so every move and every play must be carefully determined in advance. Game theory is helpful in breaking this down (although it may not often be used due to time constraints and random occurrences). In reality, game theory is a highly useful practice, and it weaves its utility into the realm of sports as the methods by which team strategies are formed. It adds a layer of formality and organization in a field where chaos can usually reign supreme. Irrefutably, the power to adapt according to the situation is an important trait in any professional athlete, but a strategy that can be executed perfectly according to plan will always trump the ability to “think fast,” which is why game theory is such a relevant component of sports like football. This entry was posted in College Football, Football, Other and tagged American Football, blitz, football, football blitz, game theory, game theory and sports, gridiron, NFL, sport, sports, sports and strategy, sports and training, Sports Archives, Sports Blogs, sports game, sports performance. Bookmark the permalink.